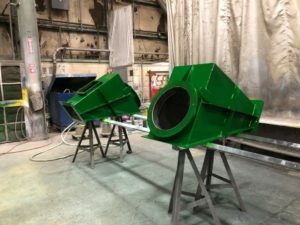 A major provider of custom-engineered solutions for air pollution control, dust collection, and product recovery turned to McDougall’s Industrial Metals Division to fabricate two (2) high-efficiency Cyclone assemblies and one (1) high-efficiency Dual Cyclone assembly for a couple of their most demanding applications and high-profile customers. Once again, we were selected because of consistently delivering on a tight schedule while maintaining superior workmanship. 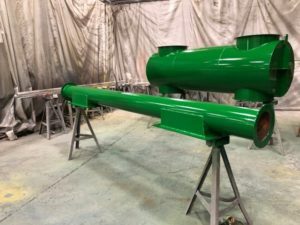 John W. McDougall Co., Inc.’s Industrial Metals Division was given the contract to fabricate eighteen (18) custom designed dip tanks for an automotive paint finishing system. 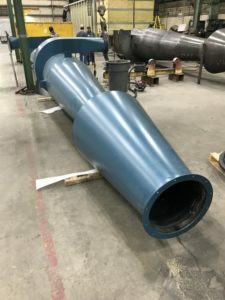 We were awarded the contract based on our shop history of fabricating this type of work from both a quality and a timely delivery standpoint. 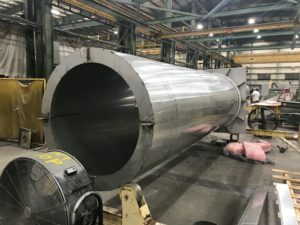 The tanks will start to ship to the job location starting the last week of February 2019. 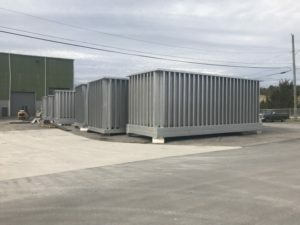 The ability for above-industry turn-around times was very evident with this project. 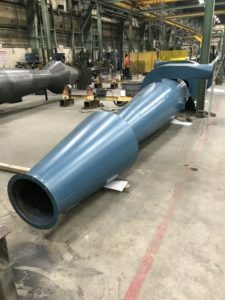 We were contacted to fabricate sixteen (16) stack silencers per the customer’s engineered design, very quickly. 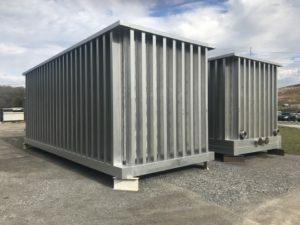 These are stainless steel, insulated stacks – fabricated in our own 100,000 square foot facility. 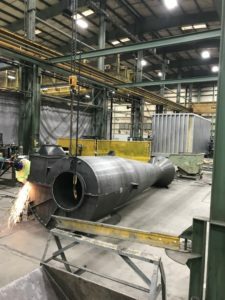 John W. McDougall Company was recently commissioned to fabricate and install an insulated Pre-treatment Spray Tank for a North American automobile manufacturer. 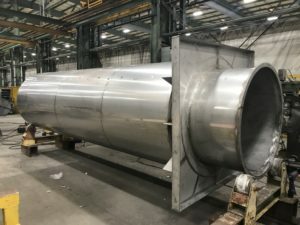 This new tank is a complete 316 stainless steel fabrication including 3/16” thick stainless steel plate, stainless steel exterior stiffener tubing, the stainless steel I-beam base, 20 gauge stainless insulation cladding and stainless pipe fittings to replace the existing, corroding mild steel tank. Fabrication, from start to finish, took three (3) weeks. 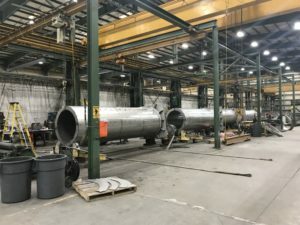 Due to our experienced team and top quality fabrication, McDougall has been entrusted by countless companies to fabricate tanks for a variety of industries. 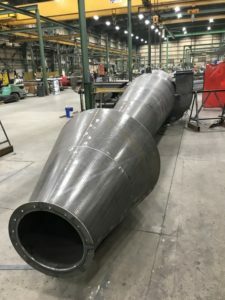 Our air tight, water tight, leak proof welding and fabrication work is one of the reasons we have so many repeat customers, some of whom have depended on McDougall for solutions for over 30 years. 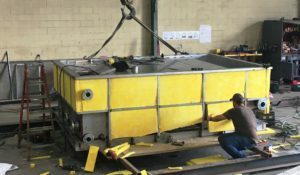 In 2015 our industrial division purchased a new heavy plate roller that allows rolling up to 3/4” x 10’ wide plate (69” ID) and up to 1-1/2” x 1’ wide (69” ID) plate. 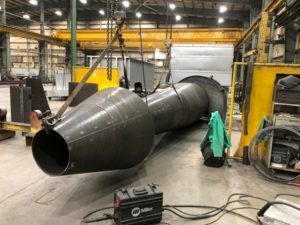 As one of only a few companies that offers this level of metal service in the southeast, we are excited to be able to provide our current and future customers with this type fabrication capabilities in-house. 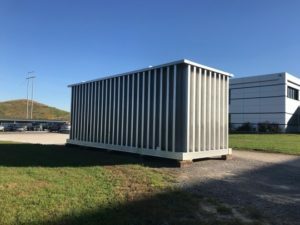 We are now able to perform practically unlimited services while cutting production and delivery time as well as contract pricing. 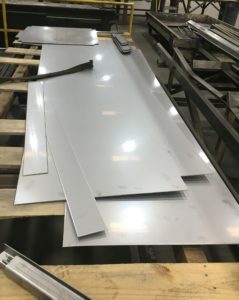 “We’ve more than doubled our plate rolling capabilities with the purchase of our Faccin Plate Roller with the capacity of 3/4” plate up to 10’ in width,” says M-Shop Vice President Mike Beacom. Upgrades like this are at the forefront of McDougall’s goals, aiming to provide our customers with unlimited and unparalleled service.